Mike Muhlethaler did his best to keep his pro dreams alive in 1990 by calling an old coach and scout, according to The Los Angeles Times. What he got was an audience of two scouts, both for batting practice and in that night's game, according to The Times. "I just went out there loosey-goosey," Muhlethaler told The Times. "All I did was swing free and easy." And, with hot play down the stretch, Muhlethaler found himself just where he wanted to be: The pros. His pro stint, though, ended up being a brief one. His professional career lasted just a single season, 62 games. 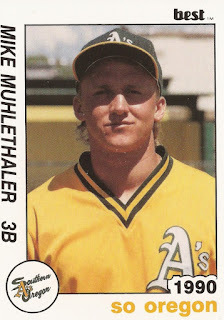 Muhlethaler turned pro in June 1990, after being taken by the Athletics in the 39th round of the draft out of the University of California, Berkeley. Muhlethaler went to Berkeley after graduating from Crescenta Valley High School in California. There, Muhlethaler also played football, winning a Times award for back of the year in his area. As a pro, Muhlethaler was sent to short-season Southern Oregon. In a mid-July, he smacked his second home run on the year. For the season as a whole, Mulethaler ended up hitting .256, with four home runs and knocking in 31. He didn't come back for a second season.